Does monitoring Countdown Team's profile page and repeatedly checking the "Last Active" date and time count as stalking? Johnny Canuck wrote: Does monitoring Countdown Team's profile page and repeatedly checking the "Last Active" date and time count as stalking? I believe they're in the studio Monday to Wednesday this week, so check again tomorrow and Friday. Johnny Canuck wrote: Will the design of the set be changed at the start of CoC XIV? In the past, CoCs (specifically, X, XI and XIII) have often been the times when the set's appearance gets revamped. Of course this might just be a coincidence that only losers with no lives will catch. That would be quite a quick change, considering that based on what CT has said, they'll be recording the Series 73 final on November 3, with the first CoC XIV prelims the next day. Any more news on CoC gone very quiet. Mark Mills wrote: Any more news on CoC gone very quiet. I believe the finals of S73 have been moved from 2nd & 3rd November to 3rd & 4th November, which makes it unlikely that there will be a CoC starting on the 4th. Perhaps the plan is to put the CoC into one three-day filming block starting from 23rd November? Graeme Cole wrote: I believe the finals of S73 have been moved from 2nd & 3rd November to 3rd & 4th November, which makes it unlikely that there will be a CoC starting on the 4th. Perhaps the plan is to put the CoC into one three-day filming block starting from 23rd November? "Sounds like" according to whom? Is that a guess, or did you hear it from someone? That would be a summer time slot. Horse racing. The draw for CoC 13 was announced late in October, with filming taking place a few weeks later. So it's probably too early to speculate as to whether or not there has been a postponement. samir pilica wrote: The draw for CoC 13 was announced late in October, with filming taking place a few weeks later. So it's probably too early to speculate as to whether or not there has been a postponement. That's true. I was just curious as to whether JR (or anyone else) had been to the studio and heard Damian confirm/strongly suspect that another postponement has happened, because that's what his earlier comment seemed to suggest to me. I have nothing from a personal viewpoint or from any internal sources. OK, cool. Thanks a million. The worry that I already had - and still have - is that the pool of contestants is far too large to select from, which was the advantage of having a COC after every four series and a Supreme Championship every 32. The issue is that since COC10 (start of 42) we've only had one at the start of 49, 60, and the 30BC at 68. 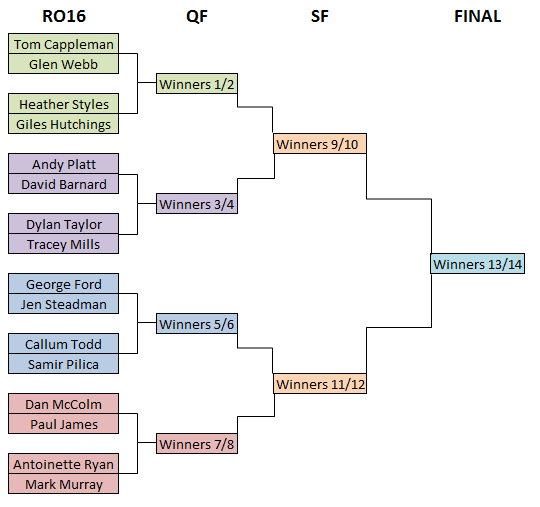 And if this is delayed to the start of 75 then the talent pool encompasses 67-74 plus some from 60-66 (Oli, Eoin, maybe even Deeksy has a case), but 16 contestants would be the 10 winners and 6 runners-up, so there's no guarantee that someone like Heather or even Tracey would get in. Mark reappearing on the show would, no doubt, be a delight to all concerned. However, he was in the 30BC, so why him specifically? We're finally ready to go with the CofC. Nov 23 - 25. 16 players. About to contact those involved and once all participants are confirmed, we'll post the draw. He lost very early on to the man who ended up finishing 2nd. It's all right, I'll present the next one. That's correct. CofC's recordings will be on the 23rd /24th /25th November. I decided not to spend too much time on this and I don't know how realistic it is. We've talked about Oliver and Eoin's inclusion for ages but I've no idea if they will actually be invited. Also, I decided to go for at least two from each series - basically the winners and finalists. That would leave room for two series to have three but I've ended up with one series having four based on the strength of the series. But it might not work like that. Obviously there are other people in with a chance, including David Barnard, George Ford and Eileen Taylor. I also had Bradley Cates and Samir Pilica on a previous list, but that was before the number of series involved went up even more. sorry if this question has been answered elsewhere, i'm a bit out of the loop with countdown stuff at the moment, but what dictionary will be in use for CoC? Will it be the ODO as of its recent update, the ODO from before the update, the old hard copy of ODE3, or something else? www.oxforddictionaries.com - The live internet version on the day, so whatever is in, is in. Is there a reason why the quarter-final line-up isn't the usual 1v8, 2v7, 3v6, etc.....?? James Robinson wrote: Is there a reason why the quarter-final line-up isn't the usual 1v8, 2v7, 3v6, etc.....?? Because there are no seeds, so why make the order more complicated than it needs to be? Remember when the 30th Birthday Championship draw was announced and I made a nice spreadsheet showing all the matches and the structure of the draw? This time I'm on holiday and so I've used different, lower-tech tools to perform the same task. I'm sure you'll agree that you can hardly tell the difference. Countdown Team wrote: http://www.oxforddictionaries.com - The live internet version on the day, so whatever is in, is in. Games 3 and 10 are gonna be whack. Cool stuff. Doubt I'll make it past round one like, but I'll enjoy every second. Awesome stuff. I think the line-up falls largely in line with people's predictions. Obviously no Garner or Monaghan, but their inclusion was speculative (and we don't know who if anyone declined their invitations). So who are the early favourites? Anyone willing to do an entire 15-match prediction? Gavin Chipper wrote: Awesome stuff. I think the line-up falls largely in line with people's predictions. Obviously no Garner or Monaghan, but their inclusion was speculative (and we don't know who if anyone declined their invitations). So who are the early favourites? Anyone willing to do an entire 15-match prediction? Last edited by Matty Artell on Thu Nov 12, 2015 1:20 am, edited 1 time in total. Too early to say, depends who has the most time available to practice. You know how it is. I'm looking forward to an avalanche of 4 large and 6 small numbers though. Eoin Monaghan wrote: Looks quality! Countdown Team - is it true that contestants aren't automatically spared a seat for CoC filming sessions they're not in? I wasn't. Kind of spared me from a tricky decision of having to contest practicing/filming with the first few weeks of uni, anyway. Seems I was just unlucky to miss out on 30BC due to age! Good luck to everyone. Do you know what the broadcast dates will be yet? My question also Jen, Sure we all want to stay and watch our friends in the other games even if Tracey gets beat and sure it applies to all contestants as we all know each other.. If Tracey loses to Dylan we would both like to be there to watch the rest as audience members. Purely based on instinct, I largely agree, although I reckon Andy could beat David in Round One (or R16, whatever), and George may just squeeze past Jen. That means we'd have QFs of Dylan v Andy (Dylan) and Callum v George (Callum). 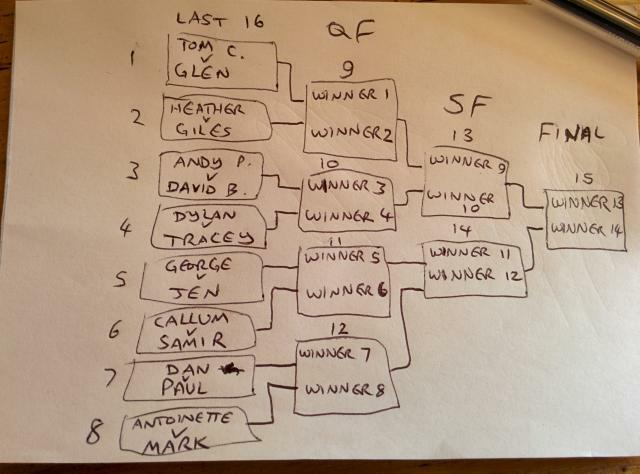 I reckon Tom will beat Giles in the quarters, setting up a Dylan v Tom semi, and again I think Dylan will prevail. In the final, however... what's the betting on a double-max for the first 14 rounds with 819 horrible unsolved conundrums until they find a winner? What my statistical analysis says when I run it through the computer later could be quite different. For example, it hugely underestimated Antoinette in the S71 finals, expecting her to lose her semi final (albeit the margin was pretty tight to make that call). I bet it'll start on January 11, so it would finish on January 29, the day before COLIN. Ben Wilson wrote: Do you know what the broadcast dates will be yet? This will be sick. We can watch the final on Gevin's TV on the COLIN train. I'm purely basing this on the fact that my latest information from my internal sources suggest that the Series 73 final is being broadcast on Christmas Day!! Final is Wed 23 of December. C of C starts on Jan 4th. That's from our internal sources. The idea that in the first round, every contestant is playing for one of the limited audience seats at the next day's games, certainly adds to the drama.